Easy to see colored golf balls beneficial for all golfers. Especially helpful for visually impaired, eye site challenged, glaucoma patients, senior men and women. These brightly colored and cool golf balls are USGA tournament approved and make great gifts. High visibility from patented reflective metallic and chrome coatings. Makes fun gifts for tournaments, birthdays, holidays and kids. Shipping: $4.95 and FREE for orders over $35. US shipping only. Free shipping on all yellow golf ball orders over $35 in the USA! Chromax® Golf balls are the only high visibility reflective color golf ball on the U.S.G.A. and R&A Conforming golf ball list. The patented Chromax® reflective yellow Surlyn® coating gives golfers a competitive visual advantage over traditional white golf balls. 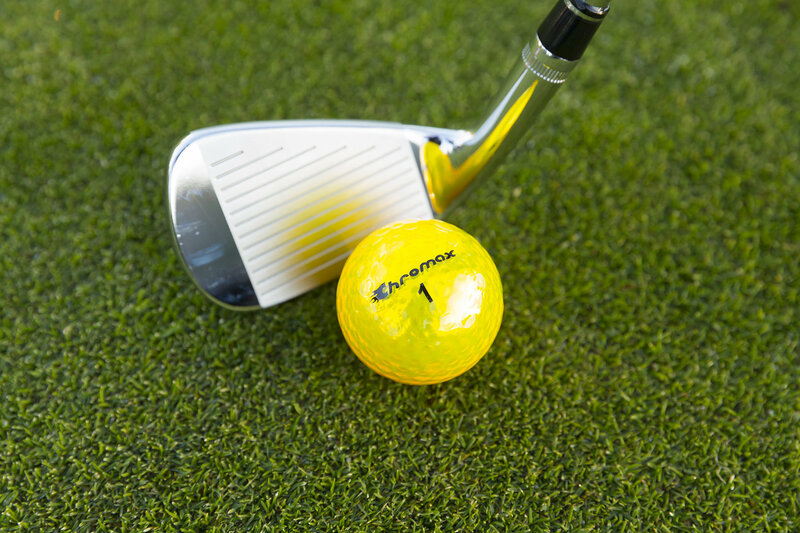 Golfing with Chromax® speeds up pace of play and reduces lost balls. Chromax® Golf ball dimple pattern creates more distance. Patented Surlyn® reflective golf ball coating. Easier to track and locate your shots. Perfect golf ball gift for all skill levels. Reusable clear tube to carry ball markers, tees, etc. 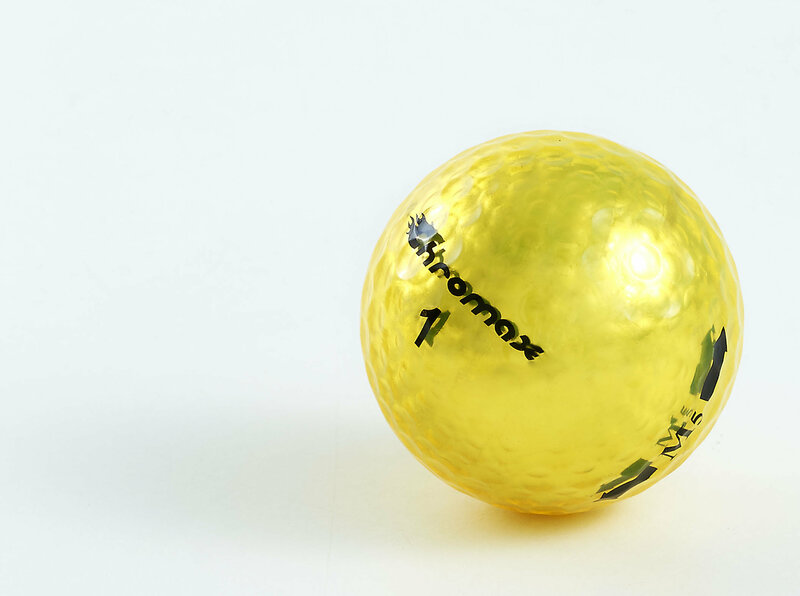 Chromax® yellow golf balls conform to USGA and R&A Rules. Inner Core The high energy core is mixed with titanium powder. It is molded under high temperatures and extreme pressure for superior durability, elasticity and a high coefficient of restitution. Outer Core The poly-resin yellow outer cover offers superior cut resistance, cold temperature flexibility, medium spin rate, and a high energy return. Dimple The 302 dimples are designed to increase distance and create aerodynamic properties that optimize trajectory and spin. Finishing Two layers of the highest grade polyurethane create an attractive, durable and stain-resistant finish. © 2019 Chromax Golf | Easy to see golf colored balls beneficial for all golfers. Especially helpful for visually impaired, eye site challenged, glaucoma patients, senior men and women. These golf balls are USGA tournament approved and make great gifts. Available colors: Gold, Silver, Pink, Yellow, Orange, Green Neon, Purple, Blue and Red. High visibility from patented reflective metallic and chrome coatings. Buy colored golf balls for fun and unique gifts for tournaments, birthdays, holidays and kids. © 2019 Chromax Golf | Buy easy to see yellow golf balls beneficial for all golfers. Especially helpful for visually impaired, eye site challenged, glaucoma patients, senior men and women. These golf balls are USGA tournament approved and make great gifts. High visibility from patented reflective metallic and chrome coatings. Makes fun gifts for tournaments, birthdays, holidays and kids. Customization by Cascade Valley Designs. Website last updated: Monday, April 08, 2019. Index.